Creates impressive autoplay menu interfaces for CD and DVD. 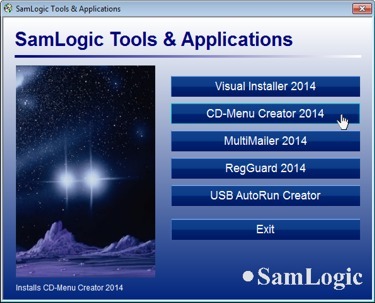 SamLogic CD-Menu Creator is an easy-to-use tool that creates impressive autoplay/autorun multimedia menu interfaces for CD and DVD. From these menus you can execute installation programs, launch applications, show documents, play movies, show graphics, explore the Internet etc. All kind of document can be opened, for example PDF, Word, PowerPoint etc. Most kind of movies formats are also supported, as MPEG, AVI, WMV, QT etc. A menu can contain buttons, pictures, movies and sound. The Windows AutoRun technology is used so a menu that is placed on a CD or DVD will be opened automatically when the user inserts the disc in the drive. No programming is needed when creating menus in CD-Menu Creator, all work is done in a visual environment. You can design a menu in many ways and you can re-use previous created menus very easy.